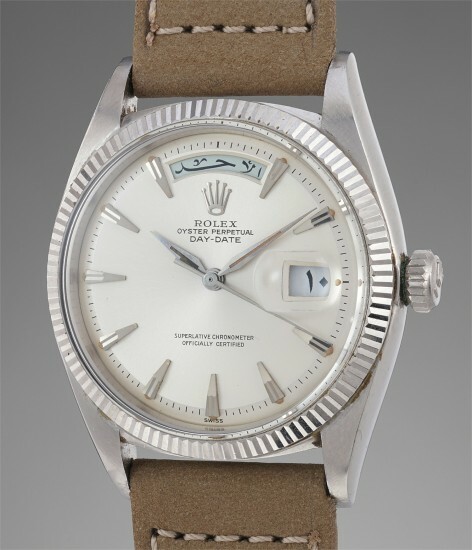 Launched in 1959, reference 1803 is one of Rolex's longest-running references ever produced. Excluding prototype models, the Day-Date model was cased in yellow, pink, and rarely in white gold and platinum and adorned with a variety of hard stones and gemstones. Preserved in most probably unpolished condition, this early reference 1803 is cased in white gold, which is significantly rarer than its yellow gold counterparts. The case is particularly stunning, with sharp, crisp and legible hallmarks beneath the lugs. The contrasting brushed and polished finishes are particularly impressive, considering the age of this timepiece. The dial is preserved in equally admirable condition, with hardly any spotting. The Day and Date wheel is in Arabic, which is fitting, considering that many white metal Day-Dates were delivered to the Middle East.